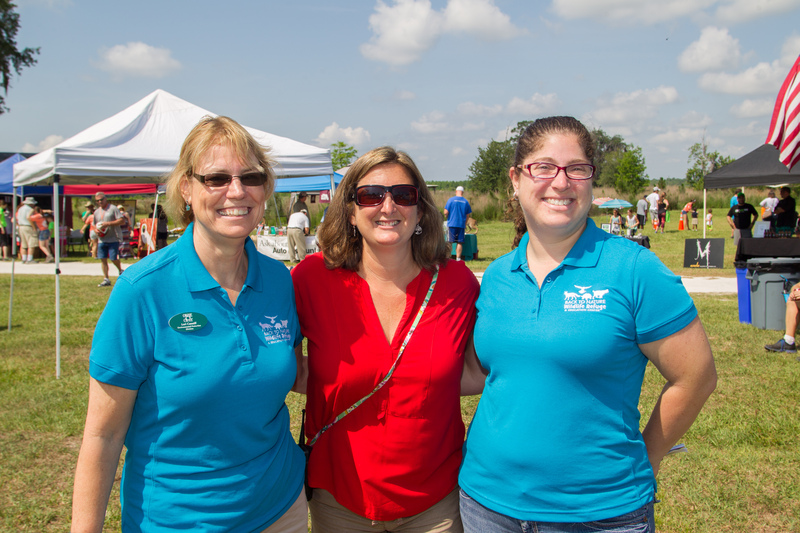 [L-R] Orange County’s ‎Deputy Director of Community, Environmental & Development Services Lori Cunniff joins Orange County District 4 Commissioner Jennifer Thompson and Back to Nature Wildlife President Debbie Kleinberg at the Back to Nature Wildlife Refuge “animal-versary” on May 14, 2016. Community leaders and local citizens came together to celebrate the three-year “animal-versary” of the Back to Nature Wildlife Refuge (BTN) at Eagles Roost Park during the organization’s annual open house. Hundreds of attendees had the opportunity to learn about Orange County’s native wildlife species and ecology by participating in BTN’s guided hikes, nature classes, animal encounters and hands-on activities. Participants also enjoyed live entertainment, food trucks, vendors and games. During the event, BTN President Debbie Kleinberg unveiled the “next big thing” – a goal for a new building on the property. Commissioner Thompson said she supports the construction of the new building and has proposed the use of INVEST in Our Home for Life funds so that a permanent building can be utilized for wildlife rehabilitation and educational courses. The building may also include a community room for local residents to use, similar to facilities at other Orange County parks. Commissioner Thompson said funding for the building is currently awaiting approval by the Orange County Board of County Commissioners and is expected to be discussed at the budget workshops in July and voted on with the budget in September. Mayor Teresa Jacobs’ $300 million initiative, INVEST in Our Home for Life, began a series of projects across Orange County that will provide long-term benefits to our citizens. Announced during Mayor Jacobs’ 2015 State of the County Address, INVEST in Our Home for Life will provide Infrastructure, New public safety facilities, Vibrant neighborhoods and affordable family housing, Enhanced recreation opportunities, Safety improvements for pedestrians, and Transportation connectivity throughout Orange County. BTN has been caring for wild animals for more than 27 years, with a mission to rescue, rehabilitate and release injured and orphaned Florida native wildlife. As a nonprofit wildlife refuge, the organization works around the clock to care for the animals to return them back to the wild. To view photos from the event, visit Mayor Teresa Jacobs’ Flickr album.